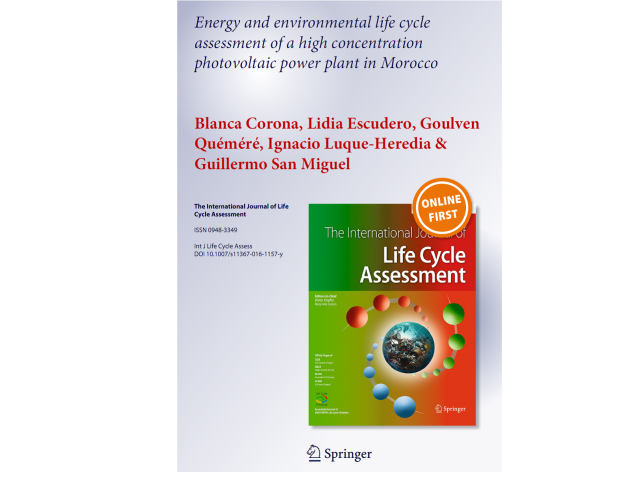 On June 30th the technical paper “Energy and environmental life cycle assessment of a high concentration plant in Morocco” was published online by the International Journal of Life Cycle Assessment. It contains the results of the collaboration between the Department of Chemical and Environmental Engineering of the Universidad Politécnica de Madrid and BSQ Solar. The aim of this paper is to evaluate the environmental impact of a BSQ Solar HCPV plant located in Morocco by determining the impact of this technology on a wide range of environmental categories. A complete life cycle inventory was gathered for the case of a 1MW BSQ Solar HCPV power plant installed in Casablanca (Morocco) (DNI 1834kWh/m2yr.). The system was evaluated using a cradle to gate approach. Cumulative energy demand (CED) and energy payback time were determined for different life expectancy scenarios (EPBT) (between 20 and 30 yrs.). In a conservative 20 yr. lifetime scenario for the plant, the results showed an EPBT of 0.862 years when recycling benefits are accounted for. This value ranks first and much ahead among all PV technologies. The main environmental impacts are as follows: climate change 53.3 kg CO2 e.q./MWh, freshwater eutrophication 28.3 g P e.q./MWh, human toxicity 44.1 kg 1.4-DB e.q./MWh, freshwater ecotoxicity 1.20 kg 1.4-DB e.q./MWh and marine ecotoxicity 1.20 g 1.4-DB e.q./kWh. The results of these analyses are expected to contribute to a better environmental design of the power plant, and its manufacturing and support optimum deployments in Morocco as foreseen within the REPHLECT initiative.